Employees brand ambassadors. Marketing and advertising are at the heart of business success. Traditionally, companies relied on celebrity branding and conventional marketing strategies, but despite their efforts employee engagement has been stagnant for several years. A Gallup study measured global engagement levels at only 13 percent, so it seems clear that old methods are no longer productive and businesses need to adopt a new approach towards branding strategy. Enter employee ambassadorship, an efficient technique that has multiple advantages and is easy to implement. A motivated workforce translates into higher productivity, better reputation, and can boost a company’s bottom line. Staff ambassadorship programmes complement traditional marketing efforts and help build a strong brand name using modern communication channels. The fact that many employee ambassadorship initiatives take place online is not random: trust barometers indicate that customers perceive staff as more trustworthy than corporate marketing, and a brand ambassador is usually given more credibility and authenticity than organisations, as customers can identify with them at a more personal level. What’s more, a study revealed that more than 60 percent of customers surveyed believed corporate social media are more credible than traditional marketing messages. Similarly, a report showed that content shared using employees own social networks generates engagement levels eight times higher than corporate profiles. In addition to coming across as more genuine, the benefits of developing an online employee ambassadorship programme include reduced costs and increased ROI. For example, research has shown that a programme involving 1,000 employees can generate nearly $2m in advertising value, and conversion rates are up to 7 times higher if the call-to-action originates from an employee social marketing programme. And by using these programmes, businesses can reach a wider audience and connect with customers that would not be achieved through traditional methods. Staff also benefit from participating, as they can widen their professional network, gain valuable skills that are in high demand, and find new career opportunities. Lastly, businesses are more likely to enjoy higher retention rates and are more efficient at change management strategies that allow them to adapt their approach to the changing needs of the market. 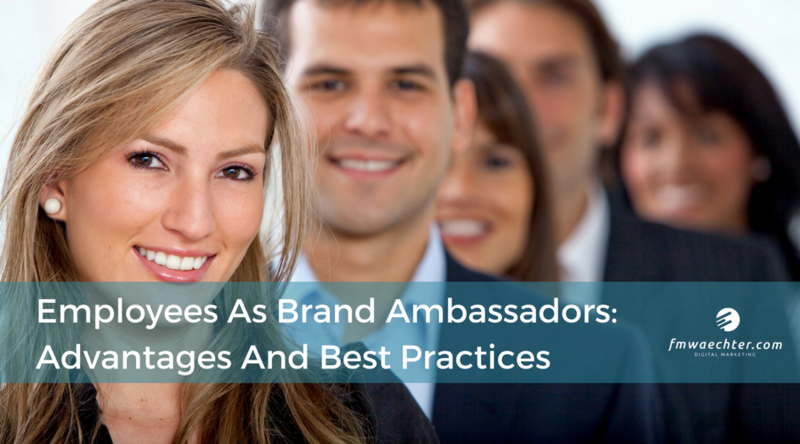 Designing a brand ambassador programme is a crucial strategy to turn employees into brand advocates. Such initiatives can be used to publicise products, services, vacancies, or events. But for employee engagement to happen, companies need a change of perspective: in these programmes, the focus is not on products or services, but rather on staff, which are seen as the organisation’s most important asset. Training: ambassadorship programmes should train employees and socialise them into brand values without assuming they already known them. Training can be made more compelling through storytelling and by highlighting the human factor since advocacy marketing is all about human connections. Choice and authenticity: employee advocacy programmes create growth pathways that straddle personal and professional development, finding alignment between an employee’s values and strengths and the organisation’s mission. As staff promote those values in social media and other online platforms, they should be encouraged to let their individuality show through, as personal voices contribute to convincing branding. For more authenticity, staff should be given a choice to promote content they can embrace and to offer feedback and suggestions. Goals and guidelines: while staff should be able to choose which content to share or promote, these programmes need to have a central focus and ensure that content illustrates corporate values and how its ambassadors embody them. Tools and resources: staff should not be burdened with time-consuming online tasks in addition to their usual responsibilities. Instead, employers should give them what they need to get started: a selection of ready-made news or content that can be easily shared to social media, curated hashtags, short videos, and/or a blogging platform are some examples. Consistency: ambassadorship programmes are not a one-off effort, but rather ongoing projects that cover the entire sales cycle, from awareness-raising to decision-making, purchase, and loyalty building efforts. This is important considering that more than 55 percent of the sales cycle is spent searching for content online. Rewards: participating staff must receive recognition for their contribution to business growth. Rewards can include everything from bonuses to symbolic awards, vouchers, invitations to special events, LinkedIn recommendations, flexible hours, etc. Motivated employees are a company’s best resource, mainly when they are inspired to use trusted channels to reach an audience and deliver a powerful message that reinforces the key values of a company and its brand. Creating an online ambassadorship programme that champions brand values can help make engagement an integral part of corporate culture and result in quantifiable benefits for business owners and staff alike.